Bama and I have just returned from our first-ever foray into the Middle East, and we cannot even begin to describe how much we loved Lebanon. It has been an exhausting 20-hour journey from door to door involving two flights and a nail-bitingly short transit in Doha, where I was felt up by airport security (lesson learned: do not attempt to smile at the staff when passing through the metal detector) – but the trouble and fatigue have been well worth the adventure of the past nine days. Before we go on, I must implore you to toss out the popular perception that Lebanon is a dangerous place. Yes, it is true that the Lebanese have been dealt the short end of the stick when it comes to recent history; now it seems unthinkable how a small country the size of Massachusetts was engulfed in a bitter civil war from 1975 to 1991 that pitted Muslim against Christian, Sunni against Shia, Catholic against Greek and Armenian Orthodox. Lebanon then was a battleground for competing regional powers: Israel, Syria, Iran, and the Palestinian Liberation Organization. Behind the scenes, the U.S. and the Soviet Union threw their support behind opposing factions and sent them arms. But the barbarity of that protracted 15-year conflict did nothing to dampen the Lebanese tradition of hospitality. In fact, the one English word everyone up and down the country seems to know is “welcome”. That warm Lebanese welcome was apparent even before the trip. Mahmoud, an old friend from my student days in Spain, was kind enough to draft an invitation letter – both in English and in Arabic – for Bama’s tourist visa application. Had he not done so, the chance of approval would have been extremely slim. And if it weren’t for classes he had to teach, Mahmoud would have picked us up at the airport himself. On that first day in Beirut, the Lebanese capital, he was not at all annoyed that we showed up half an hour late for a meeting, because we’d underestimated the walking distances around town (he was immensely relieved that we’d actually found our way there on foot). 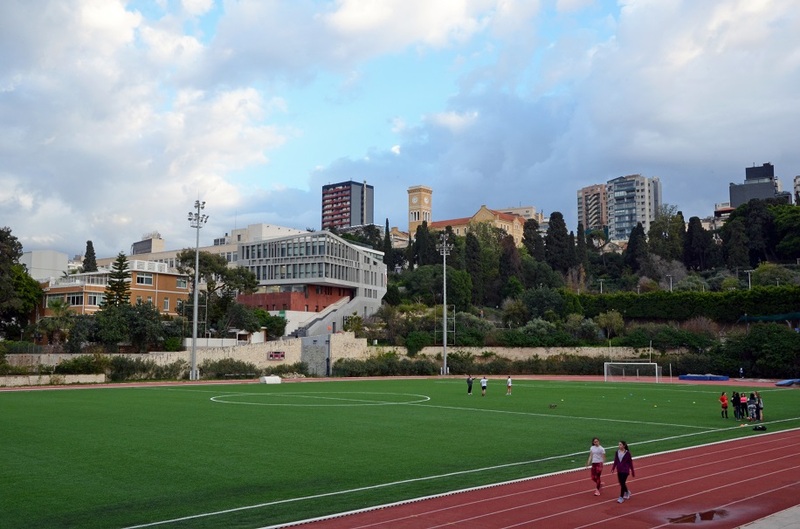 What followed was a tour of his workplace, the American University of Beirut, and the celebrated seafront promenade known as the Corniche, followed by relaxed conversation over thick Middle Eastern–style coffee. 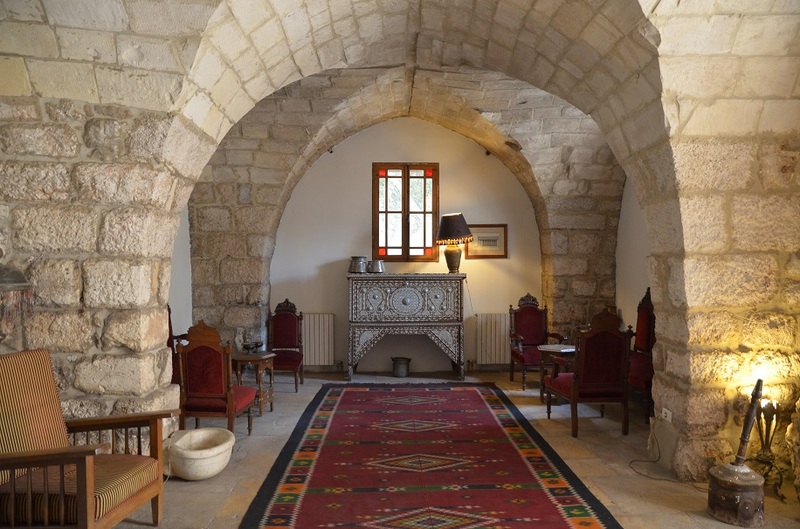 Two days later, Mahmoud treated us to drinks at a cozy neighborhood pub and then an indulgent dinner of Lebanese mezze – including the best baba ghanouj (grilled eggplant dip) that has ever passed my lips. He secretly settled the bill and called an Uber to take us back to the hotel when the night was over. Next time, he told me, he would take us on a road trip going north and south and into the mountains. Speaking of high places, the people of the Mount Lebanon region were just as hospitable. 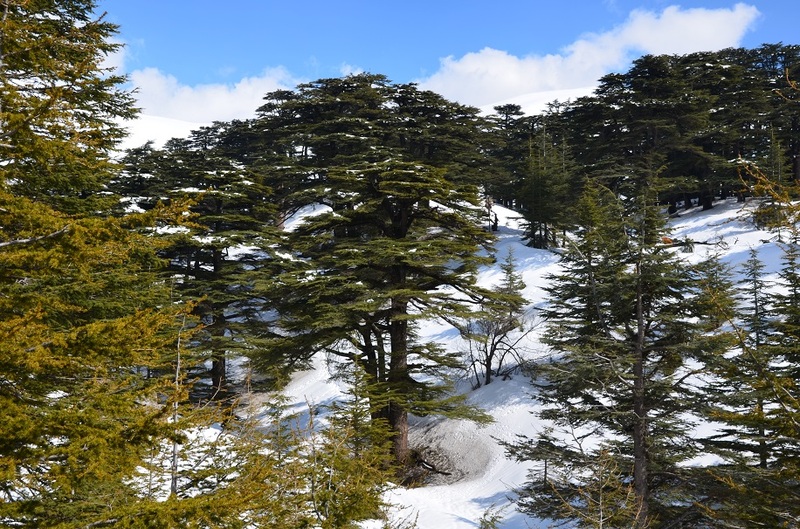 We soon met Nana, a souvenir vendor and artisan with three connected stalls right opposite the Forest of the Cedars of God, a small reserve protecting the national tree depicted on Lebanon’s flag: the fabled Cedrus libani. “Welcome!” She cheerfully greeted us as we walked past. 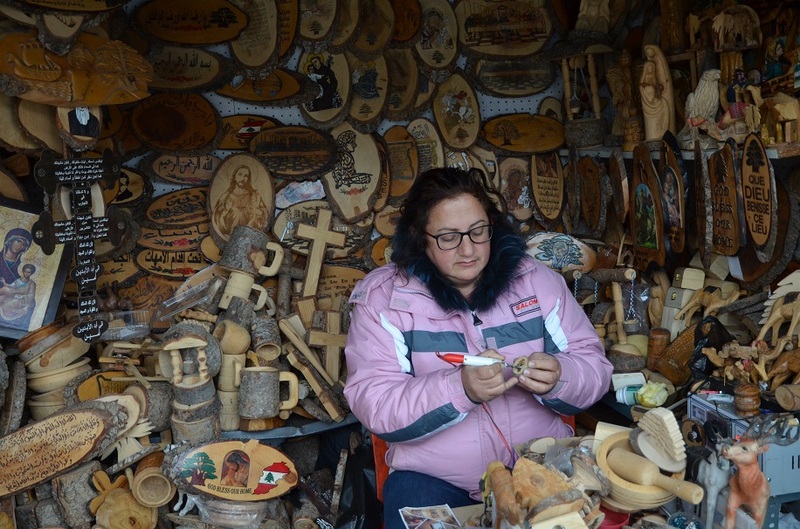 “Where are you from?” There was no pressure to buy, and when we browsed her shop after taking too many photos of the snowy landscape, Nana offered me a custom-engraved cedar wood key chain as a gift. At White Cedar Hotel & Resort, a 15-minute walk up the road, the grandfatherly patriarch and owner Rafael plied us with all manner of treats (on the house) once Bama and I came in from the cold. We sat together and talked in a cozy living room for several hours, warming up with DIY Cadbury’s hot chocolate, munching on apples grown on his nearby farm, assorted nuts and fried snacks, and carrot sticks in lemon juice, all washed down with glasses of homemade wine. And just as we were heading back to our room after Rafael left without warning, he reappeared with dessert: pockets of pita bread stuffed with his own fig and walnut jam. 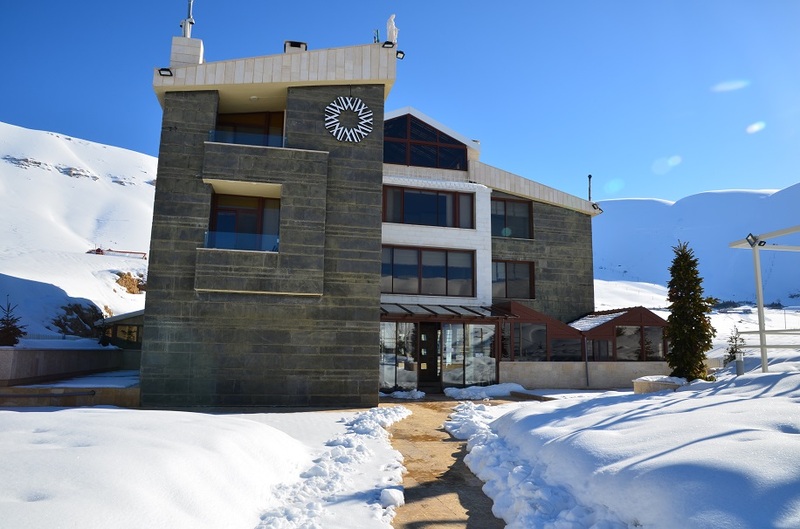 Rafael was determined to send us to bed with full stomachs, and he promised that he would stay the night at the hotel so he could drive us into the nearby town of Bsharri after breakfast the next morning. Down in the Beqaa Valley, we came across Mohamed, a taxi driver from the city of Baalbek who drove us 90 minutes from the hotel to the UNESCO-inscribed ruins of Aanjar for our final afternoon in Lebanon. On the way back, not far from Aanjar, he pulled over beside a small roadside café and asked if we wanted coffee or tea. We initially thought Mohamed wished to take a break by going inside. Naturally our instinct was to open the car doors and follow his lead. “No pay, no pay,” he explained. “I get for three of us to have in car.” Within a few minutes, Mohamed was handing us paper cups of sweet, piping-hot tea, expecting nothing in return. Great read as always James. Thanks for the first hand insight into a region that has fascinated me forever. The civil war shoved it off our list for a while. This corroborates all my notions about Lebanon. So envious of Bama and you 🙂 Shall have to seriously find ways to make a trip happen. I’ve just read Bama’s post, and now yours. Your enthusiasm is infectious! I never would have considered Lebanon, but now I will! It sounds fascinating, and lovely. Well Alison, given the enticing mix of gorgeous landscapes and ancient heritage, the delicious food, and the local hospitality, I’m beyond certain that you and Don would love it there! It will be intriguing to hear your take on how Lebanon compares to Egypt and Turkey and its near neighbor Cyprus – with which it shares a history of being conquered by many of the same regional powers. And there’s a discernible Gallic influence from the 20-odd years it spent under French rule. 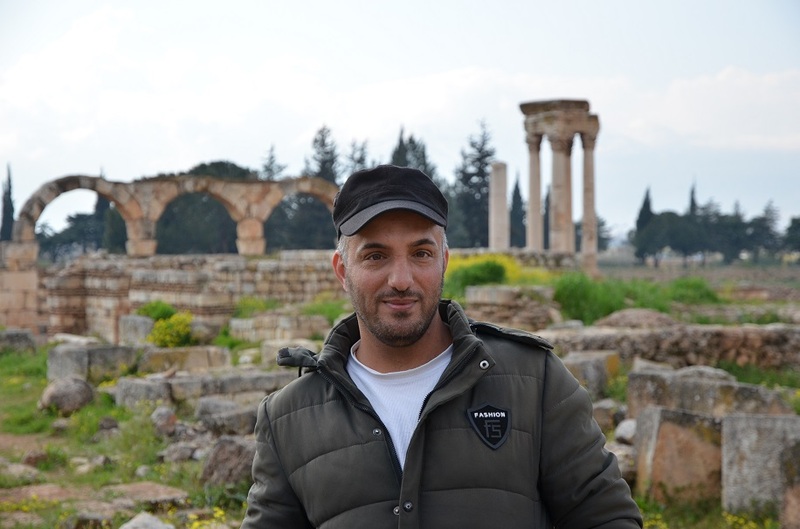 It’s a long story, but my brother has nursed a quiet obsession with Lebanon since his late teens – to the point where he lived with a Lebanese housemate while studying in Canada and even learned Lebanese Arabic. So for this reason I’ve heard a lot about the country; my father also has family friends living in Switzerland who happen to be Lebanese, and one of my best friends in college was half-Lebanese too. Your point about Southeast Asian taxi drivers is so true – that made me a bit suspicious about Mohamed’s suggestion at first. 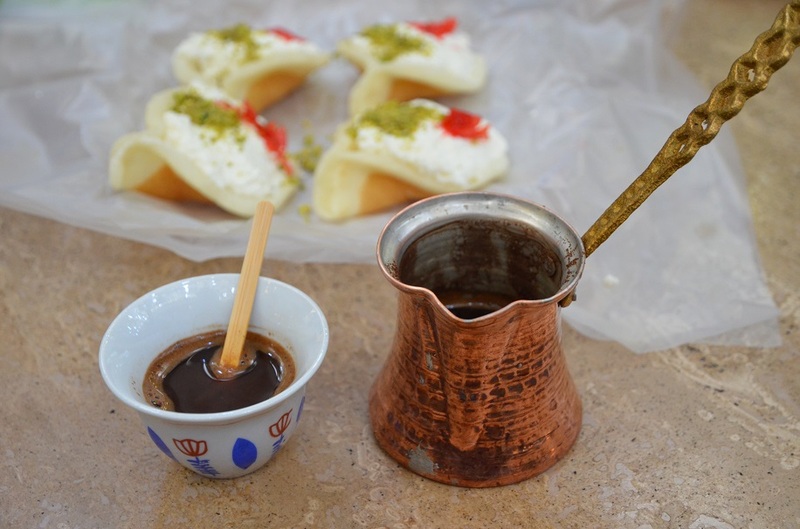 I later learned that offering (free) tea to visitors seems to be a pan-Arab or Middle Eastern tradition. You’re welcome, Len. 🙂 I guess we are really lucky that there is a Lebanese embassy here in Jakarta – hopefully they will open one in Hanoi and maybe a consulate in HCMC in the next couple of years. I’ve heard a lot about Arab hospitality so many times prior to this trip. One of the first bloggers that I followed even recounted his experience traveling in Yemen long before the current war started. At one point when he was walking around Sana’a, he encountered two opposing factions/clans/tribes. But they halted the skirmishes immediately to let him pass safely. I’m glad our experience in Lebanon didn’t have to involve this kind of nerve-wracking situation, but I’m glad to be on the receiving side of this famous custom. If only I could return their favor and kindness. I’ve heard great things about Yemen too – it’s such a shame that so many fascinating countries in the region are in the midst of conflict or not very stable. Hopefully Mahmoud will come to Indonesia at some point so we can treat him to the local food and an in-depth tour of Jakarta. Such a great post! I’ve always wanted to go here and tbh you’ve convinced me. What a fantastic trip! I’ve had my eye on Lebanon for a while now and wish I’d included it when we visited Israel and Jordan a few years ago. I’ve read up on Beirut and have friends who have visited the city, but I had little notion of the amount of snow in the mountains; that must have been a treat for you Jakarta dwellers! Well, the cooler temperatures in Beirut (it was hovering around the mid-to-upper 50s at the time) were definitely a welcome change from hot and steamy Jakarta! And I loved seeing Bama’s face light up and his sheer excitement at that very first experience of snow in the mountains. In hindsight, it’s probably a good thing you didn’t try to go to Lebanon straight after Israel and Jordan. Immigration will not let you in if you have an Israeli stamp in your passport because of the poor diplomatic ties and all the suffering and hardship Israel has caused in Lebanon in recent years: they invaded in 1982 and laid siege to Beirut, occupied the south for 15 years, and more recently, in 2006, bombed the country and imposed a naval blockade for more than a month. Anthony Bourdain himself was stranded in Beirut at the time and had to be evacuated by ship to Cyprus. We actually got our Israel stamps on a separate piece of paper for this very reason! We knew some other countries would not let us in with an Israeli stamp either. And yes, Israel has been a bane to their (and others’) existence in the region. Very sad situation. 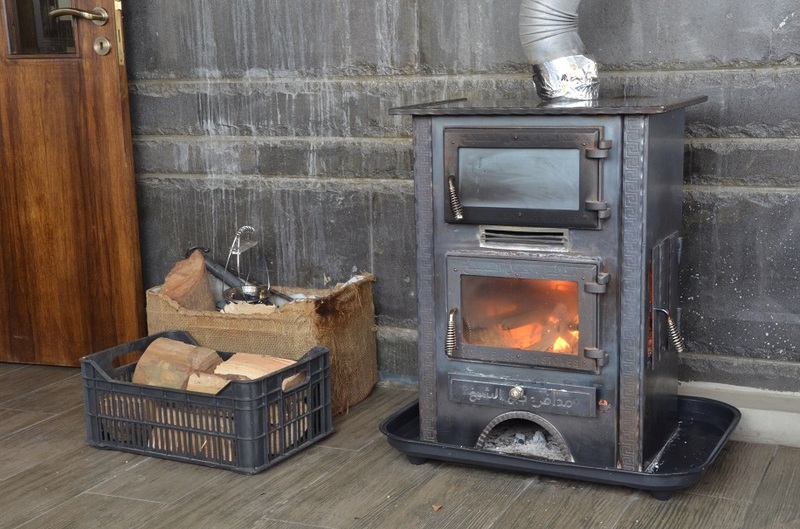 Great write up, James ~ both your words and with your photos. The Middle East continues to fascinate me, and this post as well as Bama’s gives me hope that very soon I can take a look and experience these great places and even greater people. Well done. Much appreciated, Randall! 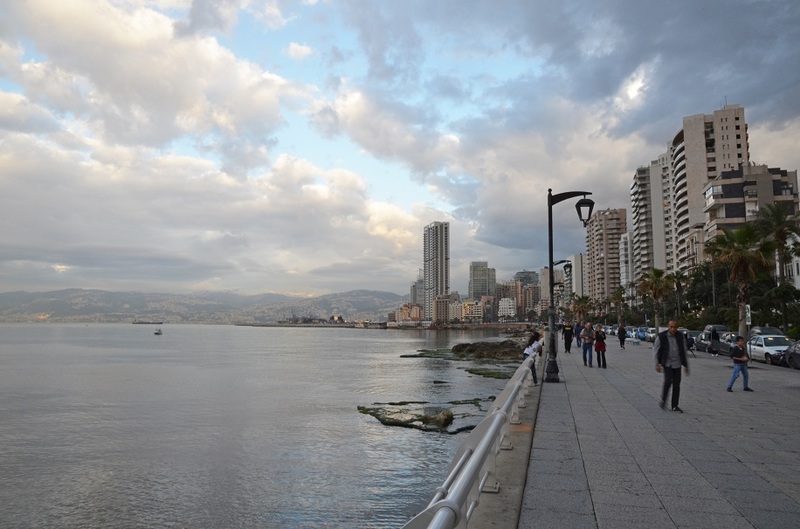 Lebanon is a fabulous introduction to the Middle East in my opinion… it certainly dispels prevailing stereotypes about the region’s cultural and religious makeup and the idea that it is merely desert. Great to see a post on Lebanon. It’s not a country that I read much about. It is interesting, and unfortunate, how wars/conflicts tend to define a country, and how this image lives in peoples’ minds long after conflict has ceased. Of course poor Lebanon also has neighbours that don’t help its image. My dad worked in Lebanon in the 50s and he spoke fondly about the country and its welcoming people. I’m glad to hear that you guys had a great experience. Another one to add to my list! 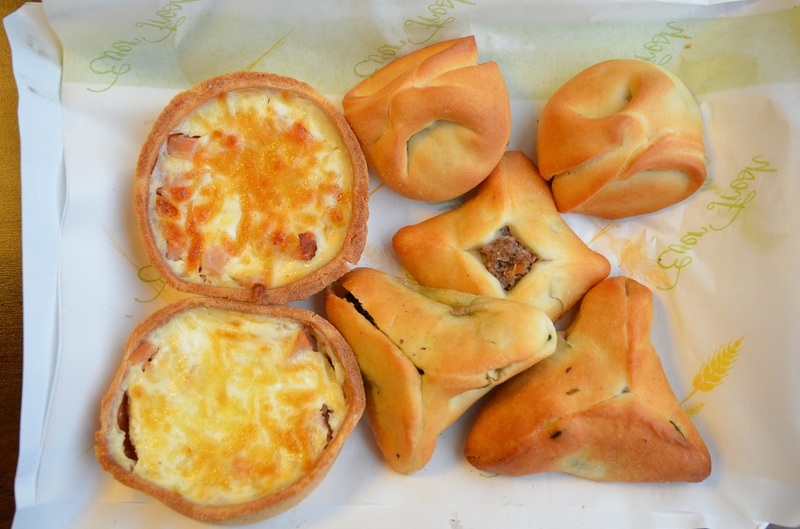 Hopefully your dad took photos of Lebanon in the 50s – that must have been a real eye-opener! Beirut would have looked completely different (and exceptionally beautiful, I reckon) in those days. If only people were critically minded enough to look beyond the negative news headlines. When I was living in Hong Kong I realized some still associated Indonesia with the anti-Chinese riots of 1998, even if that happened 20 years ago.